A reverie of feelings and sensations all captured together in one singular masterpiece of the creative mind. A story of love in its purest and most fragile state shown before the beholder. Highest quality print on canvas. 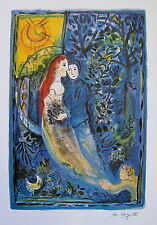 This is a Marc Chagall limited edition lithograph titled "WEDDING". This piece is facsimile signed and pencil numbered from a limited edition of 500. In mint condition, no tears stains or creases. Title: Hills of Jaffa. Highest quality print on canvas. Covered with mat varnish. Signed ready to hang limited edition giclée. 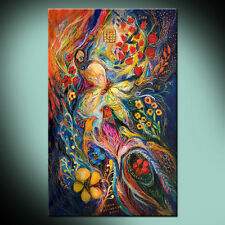 A gentle, spiritual and delightful painting that continues the legacy of Judaic art. Signed ready to hang limited edition giclée. Highest quality print on canvas. Covered with mat varnish. 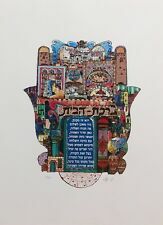 This artwork is a tribute brought to Judaic art through fascinating symbols that the watcher will discover at every glance and that will bring him luck and good fortune. This piece is numbered from an artist proof edition 1/30. 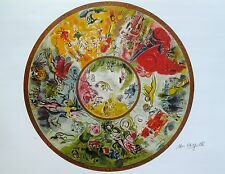 Lithograph #122/125, Signed, by Artist NISSAN ENGEL, Framed, "David"
Title: The Wind in garden. Highest quality print on canvas. Covered with mat varnish. Signed ready to hang limited edition giclée. Exists on back side with title of artwork. ABOUT THIS ART. Judaic art at its best can only be noticed in the most spectacular and enchanting stories of success, glory and strength. 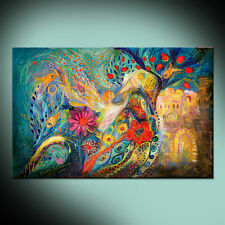 The King Bird rules upon its realm as this painting will dominate your ambiance. Title: The Patriarchs series. Whimsical, yet powerful, playful yet ceremonious, this painting is an ode painted in warm hues. Signed ready to hang limited edition giclée. Highest quality print on canvas. 9x12in handprinted Monotype. Being the nature of monotype prints, this is limited to only 1. RITUAL ASCENSION. Let your imagination run unencumbered and discover the duality of wisdom and strength through this multifaceted artwork. Title: The Golden Griffin. Highest quality print on canvas. Covered with mat varnish. Title: The Joyful Iris. Highest quality print on canvas. Covered with mat varnish. Signed ready to hang limited edition giclée. Exists on back side with title of artwork. ABOUT THIS ART. By William Blake. 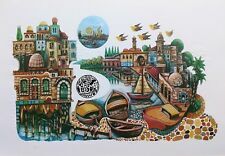 Material:High Quality Giclee Art print, printed on a gallery-quality and durable canvas.Excellent reproduction of original. Caution: for technical reasons it is possible that the image looks discoloured. Handmade, hand carved, hand printed relief print. 10x14in hand ink-washed paper. ONLY 14 AVAILABLE. Title: Shabbat Queen. The spiritual overtones of this painting are an invitation to prayer and gratitude. Highest quality print on canvas. Covered with mat varnish. Signed ready to hang limited edition giclée. Title: The Gold Whirlwind. Highest quality print on canvas. Covered with mat varnish. Signed ready to hang limited edition giclée. Exists on back side with title of artwork. The water and sky are reunited in this stunning art work. David Bovetez was born in Bordeaux, France. David's works are now in collections all over the world. A perfect fine art work to brighten any wall. This is a hand signed lithograph by Anna Thornhill titled "Free Spirit". Anna Thornhill Born 1940 in Berlin, Germany "I love drawing and making objects. I have no goal of becoming an art personality or making objects for gallery shows. Title: Ode to my flowers. Highest quality print on canvas. Covered with mat varnish. Exists on back side with title of artwork. ABOUT THIS ART. The print has extra colour edges that enough for 2" gallery wrapping. Title: Butterflies on Wind. Highest quality print on canvas. Covered with mat varnish. 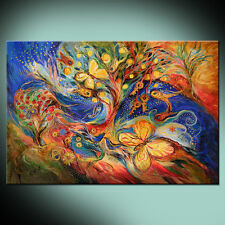 The butterfly is a pervasive symbol in Jewish art and this inspiriting painting gives it yet another symbolic horizon. Title: The Queen Lillie. Highest quality print on canvas. Covered with mat varnish. Signed ready to hang limited edition giclée. Exists on back side with title of artwork. ABOUT THIS ART. Title: Longing for Chagall. This artwork will leave you mystified and longing, connecting you to a boundless world of flashback. Highest quality print on canvas. Covered with mat varnish. Signed ready to hang limited edition giclée. Although she is Israeli born, Dorit has lived in Africa and Iran and the influences from these areas are reflected in her paintings. Her rich colors and complex textures are derived from Africa, a continent filled with warm vast savannahs. An evocative painting that uncovers the soul’s longing for childhood and innocence. The sign Capricorn is one of the most stable and (mostly) serious of the zodiacal types. These independent, rock-like characters have many sterling qualities. In his own words 'the female form is of arresting beauty, there is no other thing I care to portray through my work'. His works have been described as exquisite, an examination of his originals and prints will confirm this. He paints gardens, rivers and floral compositions in which he gives new life to nature in perfect harmony.both luxurious and peaceful. Raphael Robic was born in Nanterre in 1960 with a Breton father and a Corsican mother. Leo is the fifth sign of the zodiac. Making an impression is Job One for Leos, and when you consider their personal magnetism, you see the job is quite easy. Leos are an ambitious lot, and their strength of purpose allows them to accomplish a great deal. 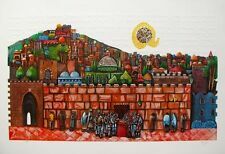 Discover the hidden beauty of Western Wall through this fascinating artwork. Its nature motives allow its viewer to get lost in its beauty and create a different story upon each new glance. Highest quality print on canvas. Title: Flowers of Sea. Highest quality print on canvas. Covered with mat varnish. Signed ready to hang limited edition giclée. Exists on back side with title of artwork. ABOUT THIS ART. During Lambert's career his art was exhibited internationally in countries such as Germany, Italy, France, England and the United States. This is a lithograph by French artist Georges Lambert titled "The Harbor". 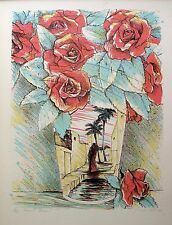 This is a lithograph by Paul Lu titled "Flower Vase. His art teaching career parallels his art making. 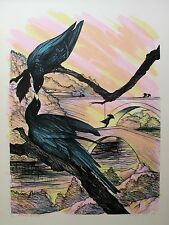 This subject is hand signed by the artist and pencil numbered 823/950. Title: The Glade. Highest quality print on canvas. Covered with mat varnish. Signed ready to hang limited edition giclée. Exists on back side with title of artwork. ABOUT THIS ART. Title: The Sky Of Eternal City I. Highest quality print on canvas. Covered with mat varnish. Exists on back side with title of artwork. ABOUT THIS ART. 1986 Mimmo Paladino Linocut 9/38 Terra Tonda Africana "Portfolio Holder"
Last photo shows Mimmo Paladino himself. Title: "Terra Tonda Africana ", SO. It is/was the portfolio that held the 6 linocuts in theTerra Tonda Africana suite. Type: Portfolio only, it's 6 linocuts arenot included Artist: Mimmo Paladino; 1948- ; Paduli, Italy. The Tree of Life emblemizes eternity, majesty and cosmic rebirth. It is a deeply personal, sensitive and quixotic creation that symbolizes the universal aspiration for continuity and balance. Title: Tree of Life. AUTHENTIC ORIGINAL ANTONI TAPIES COLOR ETCHING WITH AQUATINT IN GREEN "PETJADA" c.1987, PENCIL SIGNED AND NUMBERED 82 of 99. Highest quality print on canvas. Covered with mat varnish. 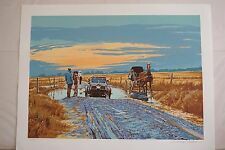 The print has extra colour edges that enough for 2" gallery wrapping. Exists on back side with title of artwork. ABOUT THIS ART. Signed limited edition giclée. 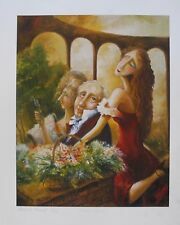 This is a hand signed lithograph by Mike Falco titled "Toymaker ". Published in 1983. This piece is numbered 585/800. Title: The Zodiac signs. Highest quality print on canvas. Covered with mat varnish. Signed ready to hang limited edition giclée. 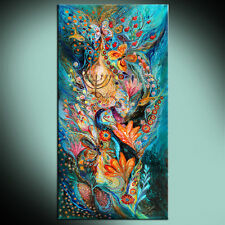 This artwork is a perfect Judaic art example of delicate brushstrokes that burst into extravagant colors curling and swirling, bathing you in waves of emotion and filling you with energy.